166 Beacon is located on the north side of Beacon, between Berkeley and Clarendon, with 164 Beacon to the east and 168 Beacon to the west. 166 Beacon was designed by architects Cabot and Chandler and built in 1882-1883 by Woodbury & Leighton and B. D. Whitcomb, builders, as the home of attorney George Otis Shattuck and his wife, Emily (Copeland) Shattuck. They previously had lived at 3 Marlborough. George Shattuck is shown as the owner of 166 Beacon on the original building permit application, dated October 25, 1882. The Shattucks also maintained a home in Mattapoisett. George Shattuck purchased the land on which 166 Beacon was built from Nathan Matthews on September 23, 1882. 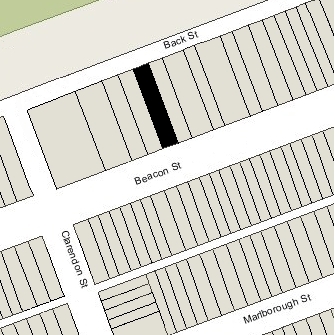 The land had several previous owners and – along with the lot at 164 Beacon — had remained undeveloped long after houses were built on the rest of the block. The lot had been owned for about sixteen years, from 1865 until 1881, by Eliza Gill (Bradlee) Winchester, the widow of William Parsons Winchester, who lived at 136 Beacon. The land originally was part of two parcels purchased from the Boston and Roxbury Mill Corporation in 1860, one parcel purchased on June 7, 1860, by real estate dealer Henry Whitwell, and the other purchased on July 16, 1860, by shipping merchant and real estate investor John Lowell Gardner. 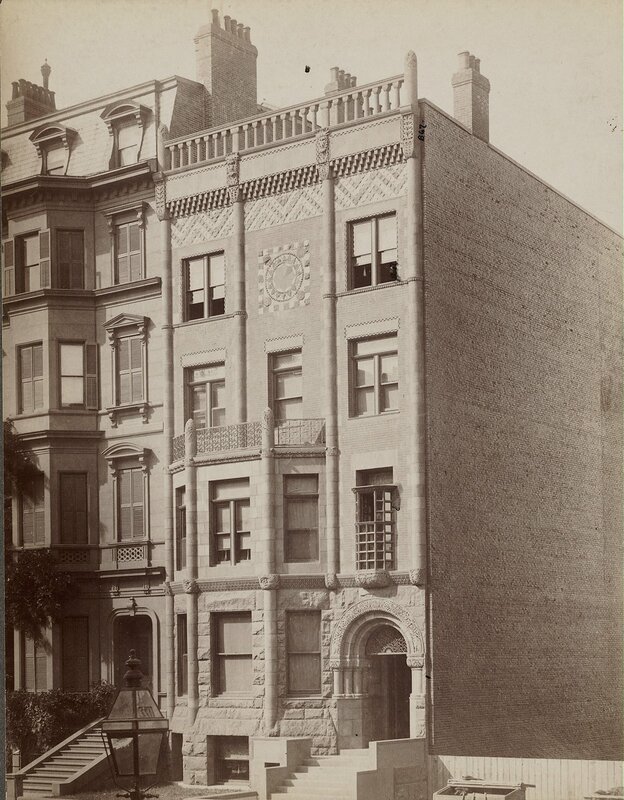 John L. Gardner and his wife, Catharine Elizabeth (Peabody) Gardner lived at 7 Beacon, and would build a new home at 182 Beacon in the mid-1860s. Henry Whitwell was unmarried and lived at 79 Beacon with his parents, Samuel Whitwell and Sophia (Story) Whitwell; they moved to 161 Beacon in the mid-1860s. Click here for an index to the deeds for 166 Beacon. 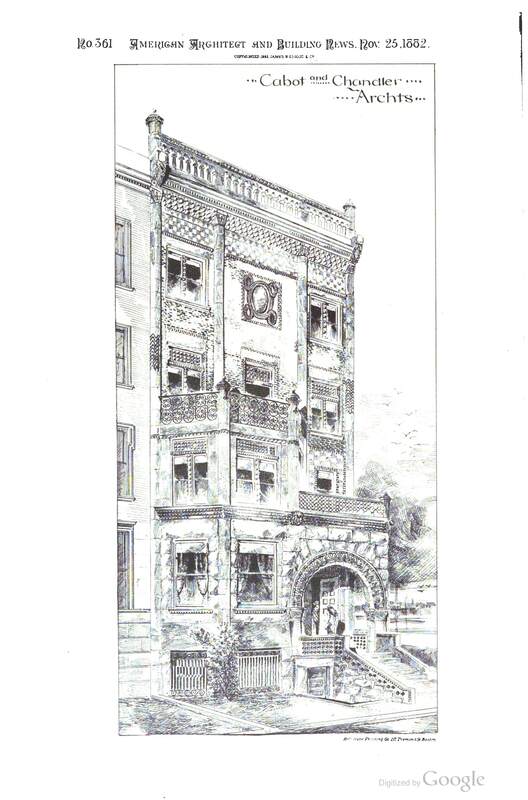 The Shattucks continued to live at 166 Beacon until his death in February of 1897. On May 7, 1897, 166 Beacon was purchased from George Shattuck’s estate by attorney Edward Webster Hutchins. He and his wife, Susan Barnes (Hurd) Hutchins, made it their home. They had lived at 113 Marlborough in 1897. They also maintained a home at Cape Rozier in Maine. Edward Hutchins died in June of 1929. 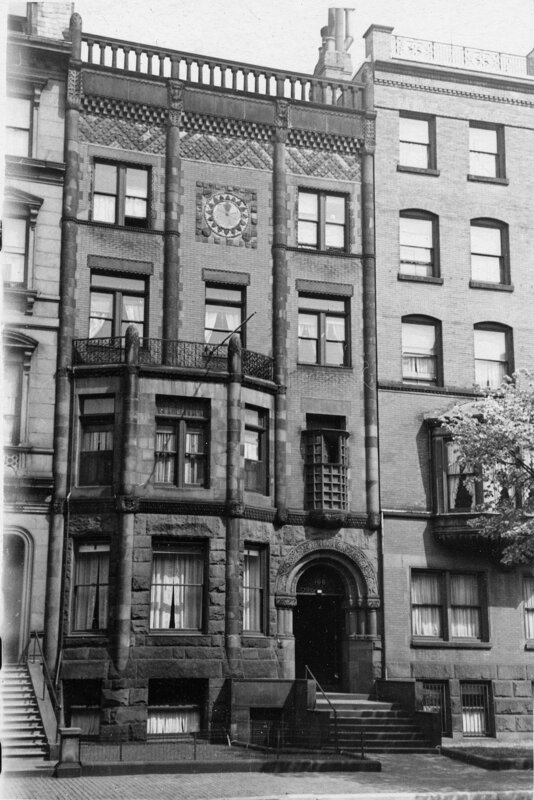 Susan Hutchins continued to live at 166 Beacon until her death in September of 1942. In September of 1943, the estate of Edward Hutchins filed for (and subsequently received) permission to convert the house from a single-family dwelling into nine apartments. On December 30, 1943, 166 Beacon was purchased from the estate of Edward Hutchins by Mayfair, Inc.
Mayfair, Inc., operated the Mayfair nightclub in Boston. It was owned by Michael (Mickey) Redstone (Max Rothstein), who also owned the Latin Quarter nightclub. He later would found and serve as president and chairman of National Amusements, Inc., nationwide film distributors and theater operators. On October 1, 1945, Mayfair, Inc., transferred 166 Beacon to Michael Redstone. The house was shown as vacant in the 1943-1949 City Directories. On April 14, 1947, 166 Beacon was purchased from Michael Redstone by Abram Bernard Fox, a furniture dealer. He and his wife, Minnie M. (Ratchesky) Fox, lived in Brookline. In May of 1947, Abram Fox filed for (and subsequently received) permission to remodel the property into ten apartments. As part of the remodeling, the front entrance was lowered and an additional story was added, making the property five stories and a basement. In May of 1948, he amended his application to reduce the number of apartments to seven. The remodeling was designed by architect Miles Standish Richmond. By 1950, the Foxes had moved to one of the apartments at 166 Beacon. On October 16, 1957, Abram Fox transferred 166 Beacon into his wife’s name. On January 2, 1964, Minnie Fox transferred 166 Beacon to their children, Franklin H. Fox, Herbert L. Fox, Alvan B. Fox, and Wilma R. (Fox) Dangel, the wife of David Dangel, co-partners doing business as Fox & Company. Abram and Minnie Fox continued to live in an apartment at 166 Beacon until shortly before his death in December of 1966. On February 14, 1966, 166 Beacon was acquired from Fox & Company by Seabrooke Estates, Inc. Milton Manin was president of Seabrooke Estates, and Myer Louis Rottenberg was treasurer. On February 17, 1966, they transferred 166 Beacon to their wives, Annette (Hurvitz) Manin and Rachel Leah (Silk) Rottenberg. On July 27, 1971, 166 Beacon was acquired from Rachel Rottenberg and Annette Manin by Calvert P. Holt. 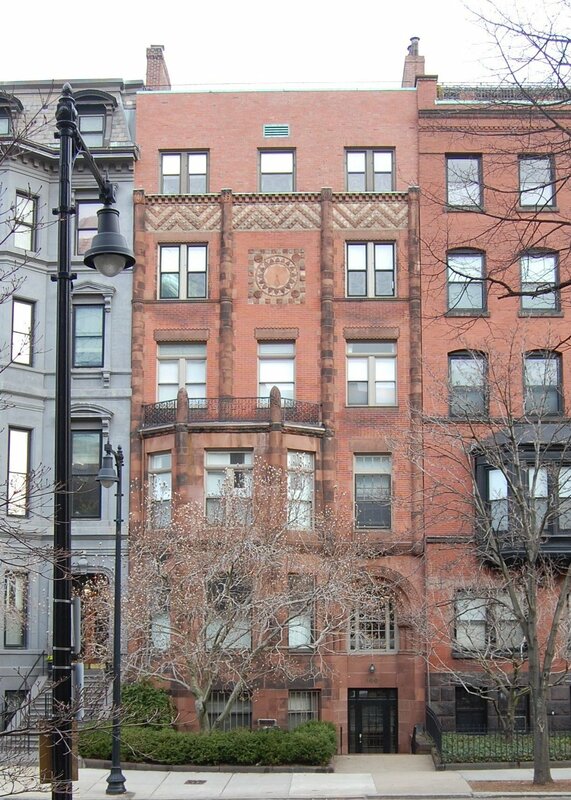 On April 27, 1973, he converted the property into seven condominium units, the 166 Beacon Street Condominium. 166 Beacon (ca. 1885), photograph by Albert Levy; Ryerson and Burnham Libraries Book Collection, The Art Institute of Chicago (Digital file #000000_100622-59).